There’s nothing more fun than showing off your finished Gunpla. But if you’re not ready to invest in (or make your own) light box, you’re not out of options. 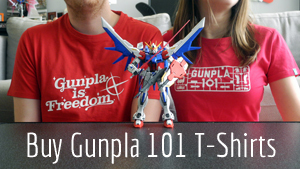 Today, Julie shows us how you can take gorgeous photos of your Gunpla by using everyday scenes to your advantage. We’ve all had that idea in our head of our Gunpla kit posed exactly how we want it in the setting it’s meant to inhabit—from humid jungles, to rubble-filled streets, or even against the backdrop of the starry night sky. You could bring that visualization to life in a diorama, but that takes a lot of time, energy, and a skill-level you might not have yet. So I’ve come up with a solution that’s affordable and comparatively less time consuming: borrowing the everyday scenery around you. My idea of using everyday settings as photography backgrounds started as a joke. I would photography a Gunpla holding my toothbrush, or serving as a bookend on my shelf. Eventually, I had a breakthrough: instead of posing my Gunpla to fit my surroundings, why not turn my surroundings into scenery to enhance my Gunpla? You only know your home and neighborhood on a human-sized level. Now, I challenge you to explore it with Gunpla in mind. Walk around your place. Think about what you want your scenery to look like, and find an everyday household substitute. Want foliage and greenery? Use houseplants or the backyard. Want an urban backdrop? Find an alleyway or street curb or brick wall. Any camera you have should be fine, but if you’re curious, I use a DSLR, specifically a Canon EOS Rebel T3i/600D. If you’d like to upgrade to the most recent version of that, you’d want the Canon EOS Rebel T6i/750D for comparison’s sake. Of course, you could also use your phone! Smartphone cameras will also do surprisingly well, especially on recent models of phones. They are especially enhanced with cheap, under-$50 lens kits like the Photojojo Magnetic Lens or Mobi-Lens series. Gunpla kits aren’t as tall as you are, so think low to the ground. Try and situate yourself in the camera’s position, low and facing up to add some monumental scale to your miniature set. In some cases, you may even need to lie flat on your stomach. For those of you who may have mobility issues, depending on camera type and size, I highly suggest tools like small tripods and even selfie sticks! You may lose a bit of dignity with the awkward poses you’ll pull if you’re out in public, but having a camera of any sort will save you more than you think. Also there’s never any shame in getting a little dirty for the perfect shot. Do you want to recreate an iconic moment? Establish a mood? Or just have some fun? As much as there are opportunities to build a battlefield with nothing more than pebbles, sticks, and a brick wall, there are other times where humourous or unexpected scenery can make an equally attention-grabbing photo. Models of course count as much as the scenery. You may want bitter rivals from respective series, or terrain types that match up well together across seasons. Personally, I found Universal Century kits of varying formats to work best for me. Definitely mix and match, though. Spending time throughout this process helped me better understand my collection and which holes in it I may want to fill! Lighting in photography is always crucial. If you want a daylight scene, know exactly what kind of daylight you desire. Will overcast work better than bright sunlight, or would artificial lighting like a desk lamp or flashlight better convey a vibrant scene? The temperature of lighting also plays an important role: overcast days or fluorescent lighting provide a cooler feeling to an image, while sunlight and your average tungsten bulbs are what give off a warmer hue. Luckily digital cameras of all kinds have a White Balance mode. Select what fits the environment best in your eyes and you won’t regret the results. Experimentation is key here, so play around, take plenty of test shots, and it’ll come together. Photography is all about patience, about experimenting and waiting for the right lighting, the right atmosphere, to get the shot you want. For example, you may need to wait until before sunset, the “golden hour” of photography, to get the right look. If you’re shooting in a public space, you may also need to wait until the coast is clear so you’re not in anyone’s way. Whatever you do, don’t forget to have fun! Whether you’re a beginner or an expert, this is a hobby in which your enjoyment is what matters most. Take a break if you’re getting frustrated, or stop altogether if this doesn’t feel right for you. For me, I found this process brought out a bit more of my inner child, being able to “play” with my kits and indulge my imagination. Got an idea you think might work? Any other suggestions for good scenery spots? Did you give it a go and enjoy the results? Show us in the comments! Julie has been making models for most of her life, with Gunpla being an old flame of hers that has rekindled over the past couple of years. When she’s not building kits, Julie is on Audio Entropy where she co-hosts several podcasts, speaking publicly about LGBTQIA+ issues, and finding whatever time is left in the day to draw and take photos. You can find her on Twitter @GatsbyLow where she tweets about all of the above, along with sharing her cooking and pet pictures, and gushing about the latest Tokusatsu series.